Following the tragic deaths of Chris Cornell and Chester Bennington earlier this year, the topic of mental health has been in the spotlight across the music industry. We have previously investigated why depression is on the rise within the rock and metal scene, plus in the new issue of Metal Hammer (and on TeamRock+) we talk to experts about how we can really make a positive change to help those struggling with their mental health. 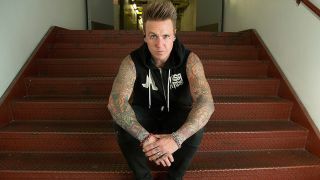 Papa Roach frontman Jacoby Shaddix is no stranger to mental illness, he sees a therapist himself and recently became an ambassador for the Re-Mind Project, which promotes compassion for those who need it. We recently sat down with Jacoby in London to talk about mental health and its relationship with rock music. Do you think the rock scene is doing enough to tackle mental health and open up the discourse? So much of the rhetoric is that if you’re struggling, you should talk to someone, but often that can be really hard for people. What do you think we can all do better? Read about how we can take positive action to help those struggling with mental health problems in the new issue of Metal Hammer – on sale now. Buy it directly here or become a TeamRock+ member to read it right now.